This pairing blends Cancer nurturing with Scorpio intensity, to create a deeply protective relationship. Together, these two will create their own, private world based on their mutual need to submerge themselves in a relationship. Sun in Cancer can be needy, and this is based on his extreme sensitivity and desire to nurture a secure home life. He guards his vulnerability with a shell that few are allowed past. In order to be let in, his partner must prove that she’s loyal and just as interested in building a nest as he is. Sun in Cancer’s focus on caring for his lover will be mixed with varying degrees of dependency, because he’ll require assurance that she’s not going anywhere. Although he can be quite protective, the secret to being with the Crab is realizing that he needs just as much protection as he dishes out. Moon in Scorpio can be possessive, and this is based on her need for control. She feels safe when she knows exactly who she’s dealing with. It will take a long time for Moon in Scorpio to open up and trust her lover, but once she does, she’ll demand complete access to his body, heart and mind. She’ll feel threatened when her partner keeps secrets (although she’ll always have a few of her own) and will use every tactic in her emotional arsenal to figure out what he’s holding back. Her Shadow side can emerge when she trades passionate bonding for a neverending series of emotional manipulations that give her the upper hand. Sun in Cancer will probably be the first to open up in this pair, as he nervously responds to Scorpio’s intensity. Despite the fact that Moon in Scorpio will keep her power under wraps, she’ll be in control (unless his Moon is also in Scorpio, in which case this could be a battle or meeting of soulmates). Sun in Cancer will be reassured by Scorpio’s powerful, background support. Moon in Scorpio will be reassured by Cancer’s commitment to focus on no one but her. They’ll create an emotional fortress whose inner rooms are closed to outsiders. And that will suit them just fine. I am cancer and my sister is scorpio, and we don’t get along at all, we are not compatible… How come? These compatibility descriptions are general. 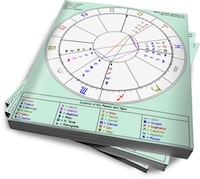 In order to asses the true compatibility between two people, a complete analysis of both their charts needs to be done, since all the other planetary connections between them need to be taken into consideration. as a lunar scorp cancer rising, ive had some iffy experiences with cancer men. i attract more pisces and scorpios than cancers. what u wrote about lunar scorps can be a lesson for any sun sign trying to date one. I am a virgo in sun and moon, and a libra in rising. The guy I’m interested in is a cancer sun, and Scorpio moon. Is this match compatible?